It’s 7:30 a.m. on a Friday morning in Northside Independent School District, and Vale Middle School Assistant Principal Cheryl Campos is barely visible through the crowd of kids huddled around her. A sense of urgency fills the air as kids give Campos purple and red slips of paper in exchange for toys, books, and passes that allow them to shadow the principal, to wear non-dress-code sandals, and other privileges. Time is short. The Vale Positive Behavior Incentive System store, manned by Campos and loosely named after the program it’s based on, is open only 45 minutes per week, and kids have been saving up their “Rays Pays” — the school mascot is a stingray — for at least a week, if not longer. 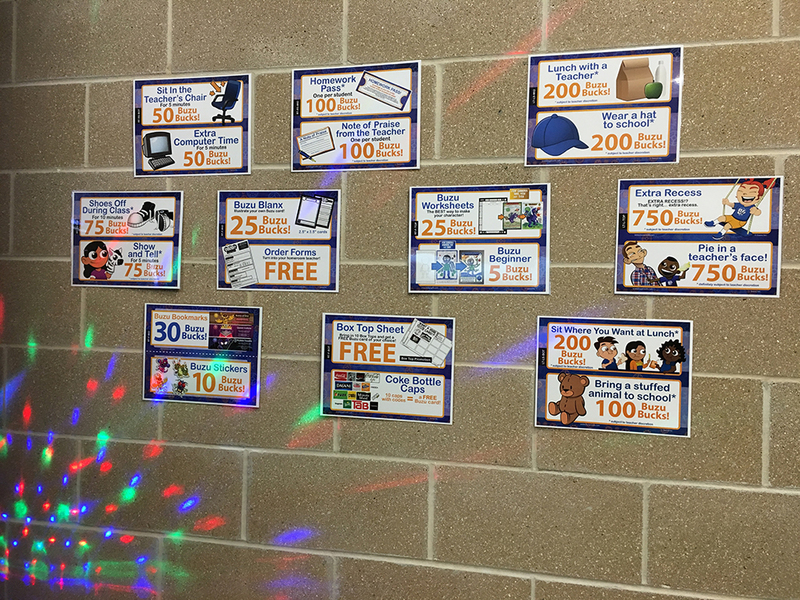 Rays Pays are given out frequently as rewards by teachers and administrators, who catch students modeling behavior prompted by positively worded signs around the schools. “Be respectful,” “push in your chair,” and “keep the cafeteria clean,” among others. D’Aira Moore, 14, traded in her Rays Pays for a pass to cut to the front of the lunch line. She explains that she would likely behave well anyway, but she sees a change in “some of the people who used to act up.” When they know they can earn Rays Pays, she says, they do what they are supposed to do. The simple reinforcement of the Positive Behavior Intervention System is one of many ways schools across the country are rethinking discipline. It is part of the restorative justice toolbox that emphasizes conflict resolution over punishment and encourages teachers to consider the culture, background, and home life of students when responding to their actions in class. The idea behind these systems comes from special education practices, where practitioners realized that positive reinforcement was more productive than constantly punishing students with behavioral disorders beyond their control. Congress coined the term “positive behavior incentive systems” when it reauthorized the Individuals with Disabilities Act in 1997. With that, Congress legislated a grant to create the Center on Positive Behavioral Interventions and Supports through the University of Oregon, which offers guidance and technical support to schools desiring to use the model. Since then, more schools have taken the system beyond special education, going school-wide with positive behavior incentive systems. In 2014, the Department of Education awarded 118 School Climate Transformation grants for between $100,000 and $750,000 per year for up to five years. The grants are to be used to train and assist districts as they build the systems for individual campuses or the entire district. But although the program has been around for 20 years and has amassed strong supporters, its effectiveness and continued survival are being questioned, along with much else in the restorative justice movement. Proponents of restorative justice practices had hoped that their methods would shrink the discipline gap between students of color and their white classmates. In 2014, the Obama administration released guidance documents urging schools to consider restorative practices and positive reinforcement, as the overuse of exclusionary discipline could be the result of racial bias. The outcome was students, especially black males, being pushed into the school-to-prison pipeline, Obama officials said. U.S. Education Secretary Betsy DeVos is currently considering a repeal of the guidance, as part of an initiative to increase school safety in the wake of the Parkland, Florida, shooting. The guidance has long been anathema to fans of zero-tolerance discipline policies. Research shows that most schools using the system of positive behavior incentives have yet to see a notable shrinking of racial disparity in campus discipline data, but the gap did close slightly. In April, the Education Department’s Civil Rights Data Collection released disciplinary data from the 2015-16 school year showing that as practices such as positive behavior incentives caught on, the number of out-of-school suspensions and expulsions in U.S. schools went down, from 3.5 million in 2011-12 to 2.8 million. However, the data also reveal that the racial disparity in suspensions and expulsions may be widening in certain ways. In 2011-12 and 2013-14, black students were three times as likely as their white peers to be suspended or expelled. That number does not appear to have changed. When it comes to arrests, however, the gap has grown. In 2013-14, black boys accounted for 27 percent of school arrests and law enforcement referrals, even though they only represented 16 percent of the population. In 2015-16, that 11-point disparity had grown to 16. Black boys made up 15 percent of the student population and 31 percent of law enforcement referrals and arrests. Still, practitioners of positive behavior interventions insist that the changes in school climate are a rising tide that lifts all boats. “It’s about that relationship piece,” Vale principal Dana Gilbert-Perry said. The program is working at Vale, says Gilbert-Perry. In its first year of positive behavior incentives, the 1,300-student campus is on track to reduce exclusionary discipline by around 10 percent to 15 percent, from 260 to around 230. Pease Middle School, also in Northside ISD, is in its third year of the program, and it has seen a decrease of almost 25 percent in that time, from 304 suspensions and expulsions in 2014-15 to around 220 among its 1,120 students, according to school district data. Those numbers have an inverse as well: Kids who are not suspended are in class learning. “Every opportunity we have to keep kids in classrooms with talented people … improves their experience at school,” Northside ISD Superintendent Brian Woods said to a gathering of positive behavior incentive teams from across San Antonio in March. He applauded them for leading the three-year roll-out process at their home campuses. Positive behavior incentive systems are more than just a carrot instead of a stick. While students are rewarded for doing as they should, those rewards have to be undergirded by constant affirmation and feedback on student behavior. Teachers have to treat behavior the way they would treat grades: something to strive for and improve upon. To realize the full benefits of the program, 80 percent of campus staff must actively participate, Stewart said, which is a lot to ask. The district started with a handful of campuses in 2014 when it received a $1 million Federal School Climate Transformation grant. Four years later, Northside has these systems in place on 27 of its 119 campuses, and it plans to add five more in the final year of the program. Stewart and her colleagues are worried that changes in the Department of Education could lead to a termination of the grant. DeVos’s budget continues the grants but prioritizes those that go to opioid abuse prevention. Northside, with 106,000 students, is the largest of San Antonio’s 17 school districts. South San Antonio ISD, San Antonio ISD, and Southside ISD are also participating in the program. The system hasn’t received universally rave reviews. South San Antonio ISD is making budget cuts as it anticipates a shortfall of over $6 million next school year due to declining enrollment. At a recent town hall with administrators and board members, South San High School student Amri Chapa, 16, suggested scrapping the positive behavior incentive program and using that money some other way. She said that the rewards felt arbitrary and weren’t actually making a difference. South San Antonio ISD Superintendent Abelardo Saavedra explained that the money was tied to the Positive Behavior Intervention System and that if they discontinued it, the district would have to decline the funding, not reallocate it. “Deny the grant and maybe try something better,” Chapa replied. Still, the data are enough to sell some district administrators on the program. A significant body of research links suspension to dropout rates. A 2012 Johns Hopkins University study found that while 16 percent of Florida ninth-graders with zero suspensions eventually dropped out of high school, 53 percent of those with four or more suspensions left school before graduating. That same study showed that suspension was disproportionately used with black students, contributing to a widening gap in graduation rates. In April, the U.S. Government Accountability Office reported that although black students make up 15.5 percent of the U.S. student population, they account for 39 percent of all suspensions for the 2013-14 school year. A year later, the 2014-15 graduation rate for white students was 88 percent. For black students, it was 75 percent, according to the National Center for Education Statistics. In most cases, schools using positive behavior incentives with maximum fidelity to the system have a slightly narrower gap in racially disparate discipline rates than the general population, according to a study by Kent McIntosh et al. The University of Oregon research team compared data from all schools registered to use a software system needed to implement the positive incentive program and national data from the Civil Rights Data Collection database. The “risk ratio” for out-of-school suspension for all black students in 2013-14 was 4.33 to 1, while the ratio for positive behavior schools is 3.67 to 1. In Northside ISD, the most recent Civil Rights Data Collection also showed a gap for black students, who make up 6.4 percent of the student population but 10.9 percent of in-school suspensions, 12.6 percent of out-of-school suspensions, and 13.7 of expulsions. White students are underrepresented, at 18.9 percent of the enrollment and 14 percent of in-school suspensions, 11.3 percent of out-of-school suspensions, and 13.1 percent of expulsions. Hispanic students, the majority of Northside’s enrollment at 68.8 percent, are most proportionally represented, with 70.4 percent of in-school suspensions, 72.1 percent of out-of-school suspensions, and 68.8 of expulsions. At the school campus level, the gaps for black students looked similar, and they continued once positive behavior incentives were implemented. Black students at Vale Middle School made up 8 percent of the population and 13 percent of the exclusionary discipline cases in 2016-17, the year before they started the program. At Pease, the discipline gap actually widened, from a one-point disparity between enrollment and discipline rates for black students in 2014-15, the year before they started the program, to a five-point disparity in 2016-17. However, the program’s value doesn’t disappear once a kid does land in trouble, says Darrell Rice, principal at Northside Alternative High School. Rice is an avid believer in positive behavior incentives; he uses the system to redirect students who arrive at his school after having been sent away from their home campus for two weeks or longer. Many of the infractions that land them at Northside Alternative involve having or using controlled substances on campus or fighting. More minor, habitual infractions like cutting class or disrupting class can also lead to alternative school at the discretion of the student’s home campus administration. “Our philosophy here is ‘good kids, bad choice,’ ” Rice said. His goal is to “get them back to their home campus better academically, making better choices.” Given the population he works with, campus discipline is a frequent part of that challenge. “How we’ve been able to drop in-house suspensions and out-of-school suspensions is dramatic,” Rice said. Since 2012-13, the number of Northside Alternative High School students receiving in-school suspensions dropped from 112 percent to 31 percent, and out-of-school suspensions went from 157 percent to 35 percent (the numbers over 100 percent indicate that many students received multiple suspensions). More dramatically, they’ve seen recidivism — students who get sent back to Northside Alternative repeatedly — go from a high of 85 percent to 12 percent between 2012-13 and 2016-17, an indicator that students are taking their lessons back to their home campuses with them. 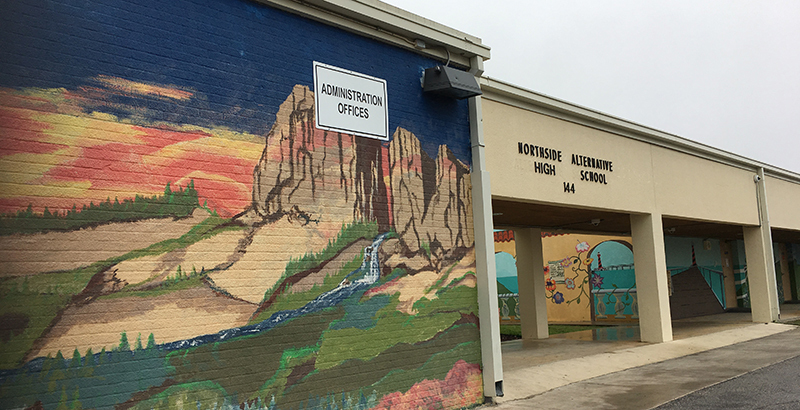 Enrollment changes frequently, but the Texas Education Agency places Northside Alternative’s student enrollment at roughly 90 percent Hispanic, 14 percent black, and 11 percent white. The school does not participate in Civil Rights Data Collection surveys, so it’s hard to tell if Rice’s use of the positive behavior incentive system is more effective than the national or district averages. Even at the alternative high school, where students only attend for 15 to 30 days at a time, Rice stresses the importance of relationships. Teachers have to build rapport “instantly,” he says, so it’s important to focus on student strengths and to pick the right battles. “Some of the smartest people in the world have a hat turned backwards,” Rice said. The Positive Behavior Intervention System does even more than keep kids in school, Gilbert-Perry, the Vale Middle School principal, said. It fills a child’s life with thoughtful questions, compassionate conversation, and praise. This is important for all kids, she said, but especially kids stressed by poverty. Around 50 percent of Vale students meet the qualifications for free or reduced-priced lunch, and helping teachers relate positively to those students is crucial to their success. Relationships, according to University of Connecticut researcher Tamika P. La Salle, are essential to equitable education, and they are the foundation of the entire positive behavior incentives program. In March, La Salle spoke to program teams in San Antonio and challenged them to take their training a step further toward practices that might have a larger impact on the racial gaps in discipline. Culturally responsive practices, La Salle explained, go beyond race and ethnicity. For a teacher to truly create a bond with a student, they have to be aware of the challenges faced by people who share that child’s culture, but not assume that the child will manifest all of those traits. It’s a delicate balance. Northside ISD receives the majority of student refugees arriving in San Antonio. Colonies North Elementary School has students from 43 countries, and around 260 of its 750 students speak a native language other than English. There, teachers said, positive behavior incentives have been a helpful tool to teach cultural norms without punishing kids for common behaviors in their home culture or refugee camps. Things like raising hands to speak, walking single file, and sitting at a desk all have to be learned. A student who refuses to look a teacher in the eye may be expressing respect in their home culture. To make positive behavior incentive systems and other relationship-based interventions work, teachers also have to commit to looking for the strengths of students from different backgrounds —even if they aren’t expressed in a familiar way. A simple desire to complete a task could be mistaken for stubbornness if a child can’t articulate her desire to finish her work. A teacher might miss a child’s strong sense of justice if she simply focuses on behavior that feels aggressive. To bring those students into an equitable learning environment, La Salle, said, teachers themselves have to acknowledge their own culture and biases. “We all have that in us, right? It’s not going to go away,” La Salle said. The key is knowing it’s there — and being ready to make sure that bias doesn’t dictate your actions. Bekah McNeel is a San Antonio, Texas-based reporter, writing primarily about education.